Roughly 55 meters, that’s how tall this stadium is. Since 2015 it dominates the skyline of northern Puebla, which is exactly what was the goal here. It stands close to the highway leading towards Mexico City and was planned to be a landmark even for people not driving into the city. So it’s big, but is it beautiful? 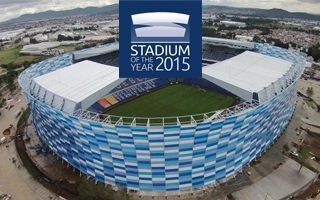 That’s for you to decide in our online vote for Stadium of the Year 2015! It doesn’t seem like authorities in Puebla had another choice but to make it even more impressive. The stadium already had two grandstand rising well above the landscape since 1986. Now two other structures joined them behind the north and south goals. Not that you would know without looking inside, because the entire stadium is now wrapped in what is one of the world’s largest ETFE wraps. Creating a light blue mosaic (fitting Puebla FC colours very well), the wrap is created out of nearly 6,000 single sheets and covers some 30,000 square meters (or 3 football fields!). By day neutral, at dusk changing its colour along with the sun, in the evening this stadium’s façade can be illuminated both from the inside and outside, displaying various patterns. The fact of being wrapped in an oval outer form despite corners not being filled makes this stadium’s layout one of a kind. There are semi-open plazas created in the corners, making the stadium feel more airy and spacious. Of course it wasn’t just the outer skin and additional stands that were built. altogether the stadium gained under 10,000 capacity, all seats were replaced, roof structure renovated, new lighting and video systems installed, 80 private boxes added as well as new concrete promenades and parking sites around (for 3,600 cars). What was initially expected to cost 540 million pesos ended up at roughly 700 million. This may seem like a significant inflation, but please mind that it still represents only $40 million. For all the above-mentioned changes it still seems to be a very decent deal.